How can you improve your posture and fix rounded shoulders? Most people I see at my Physical Therapy clinic develop a rounded shoulder posture either when they slouch in a flexed position or when they exercise or do activities that involve repeated movements that compromise their posture. In each of these cases, rounded shoulders can be avoided with a few steps. In today’s blog, I am going to identify the sources of rounded shoulders and provide instructions on how you can correct your rounded shoulders and potentially achieve perfect posture. Rounded shoulders are the result of poor posture. It is that rounding of the back and forward head posture you see so often in today’s society. The medical term for rounded shoulders among clinicians is orangutan posture. 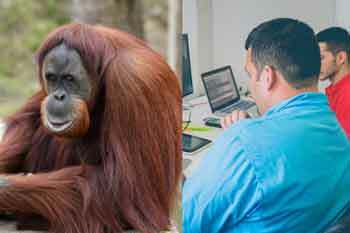 I use the term “orangutan posture” when speaking to other Physical Therapists. Rounded shoulders can lead to hyper kyphosis, Dowager’s Hump, shoulder blade pain, and compression fractures. For people with osteoporosis, osteopenia, or low bone mass, having rounded shoulders is something you want to avoid and eventually fix. The sooner you avoid rounded shoulders, the better it will be for your long term health. To have perfect posture, on the other hand, you need to maintain postural alignment and keep your head straight above your spine. Perfect posture requires a strong foundation — starting from our feet, to our pelvic region, and up into our spine. In this blog we talk about how to actively engage your posture muscles throughout the day to achieve your best posture. 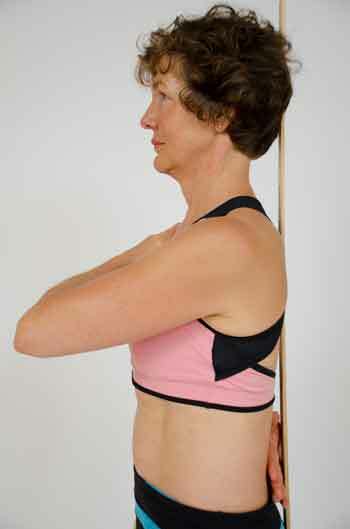 In the photo, I am using a one meter stick to demonstrate proper postural alignment. The back of my head is touching the stick, as is my upper back. I have a slight space, about a hand-width in total, between my lower back and the stick. There are several ways to test if you have rounded shoulders. If either of these is true, you likely have rounded shoulders and should take steps to correct your posture. Look at recent photos of yourself. Rounded shoulders is sometimes referred to as the orangutan posture. Do you have that look? If yes, this indicates that you have a rounded shoulders posture. Stand in your usual stance and let your arms hang freely. If both palms are facing behind you and your thumbs are pointing in, then you have rounded shoulders. This rounded shoulder test is sometimes referred to as the “back reach test”. There are four parts. Right Side: Stand in you usual stance. Reach behind your back with your right arm. Your right elbow should be pointing at the floor. Use your thumb and index finger of your right hand to measure the distance between the bottom tip of your shoulder blade and your spine. The distance for an average sized person should be no more than three inches. If your score is higher (give or take based on how big a person you are) then you probably have rounded shoulders. Left Side: Perform the back reach test on the left side with your left arm. Is the distance between the spine and the left shoulder blade more than three inches? If yes, you have rounded shoulders. Test Completion: If you are unable to complete either of the back reach tests because you are so tight in the front that you cannot reach back, you probably have rounder shoulders. Comparison: The two distances you measured between the shoulder blades and the spine should be the same or close to the same. A large difference might indicate a shoulder imbalance and you should consult with a Physical Therapist. Stand in your usual stance. Place your finger at the very top of your sternum at a location called the suprasternal (or jugular) notch. Think of a glass of water. If the glass is glued to a surface that is perfectly vertical, the glass should not tip and spill water. Now imagine the same glass of water glued to your suprasternal notch. Is the glass tilted forward? Does water spill out of the glass? If either of these is true, this indicates rounded shoulders and your objective is to keep your sternal notch elevated and flat. Stand in your usual stance and place a one meter stick or broom stick behind you. Look in the mirror or, even better, have a friend take a side photo of you. Are you able to keep the back of your head and upper back in contact with the stick while, at the same time, maintain a slight space, about a hand width in total, between your lower back and the stick? You slouch when you sit and and let your body shape to the contour of the chair. Do this repeatedly over an extended period and you will develop rounded shoulders. Your exercise program or your activities mostly include movements that reinforce rounded shoulder posture. Over time this will lead to rounded shoulders unless you do movements and activities to counteract the forward head posture. You are not aware of your posture and over time certain postural muscles get long and weak while others get short and tight. We spend much of our lives sitting (some would argue we spend too much time sitting). Unfortunately, when we sit we can compromise our posture. As a result, we need to be mindful of where and how we sit. Let’s start identify why some seats encourage poor posture and specifically, rounded shoulders. Many chairs have a seat pan that is tilted slightly backwards and this causes the back of the chair to lean back. You often see this with benches in public parks or seats in common areas. Your knees get a little higher than your hips. As you sink back into the chair, your shoulders get rounded. Your pelvis and spine can no longer hold your ribcage up. A collapsed ribcage will force your shoulder blades forward. This will force the shoulder joint forward. Finally, you go into a rounded shoulder posture. If you spend hours of your day in this position either reading, using your computer, or watching TV, then after many days, you will develop rounded shoulders. You will have trained your shoulders that this is where home is, where you are comfortable and where your posture should settle. You develop rounded shoulders because certain muscles in the shoulders and the back get tight and and other muscles get long and weak. To change this you need to be mindful of your sitting position and posture and likely, perform exercises to stretch specific muscles and strengthen others. To avoid rounded shoulders when you sit, we need to take into account two situations. In the first situation, you are in a public space and you cannot modify the structure of the seat. What should you do? In the second situation, you own the chair. What modifications can you do to your chair to avoid rounded shoulders? Let’s start with the first situation. 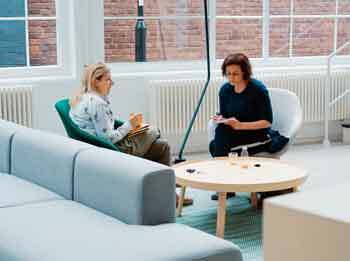 How do you modify your sitting position at a public bench, for example, in order to support your posture and reduce the incidence of rounded shoulders? We can do this with two small modifications to the way you sit. First, sit on the edge of the bench. This allows you to naturally take control over your posture. It causes you to use your back muscles to hold your head over your shoulders and your shoulders over your hips. Second, drop one of our knees. This causes your pelvis to tilt enough to create a little roundedness in the small of your back. This, in turn, aligns everything nicely. Can you modify your chair and avoid rounded shoulders or do you need to spend a lot of money and buy a new, posture-friendly chair? Let’s save you the money and instead make some small changes to your chair! There are three simple modifications that you can make to most of the chairs you own or use regularly. Place some cardboard under the two back feet of the chair. Use duct tape to make the modification permanent. Felt pads with adhesive sides will do the trick, if you do not like the cardboard. Use more than one felt pad (or cardboard sheet) until the seat pan is level. If you do a lot of forward leaning tasks in the chair, use felt pads to bring the seat pan into a slight forward tilted angle. Make sure that the chair is stable after the adjustments. The second modification is to use a back support for your lumbar spine. Choose a back support that is the right size for you. The exact size depends upon the angle of the chair and how big you are. 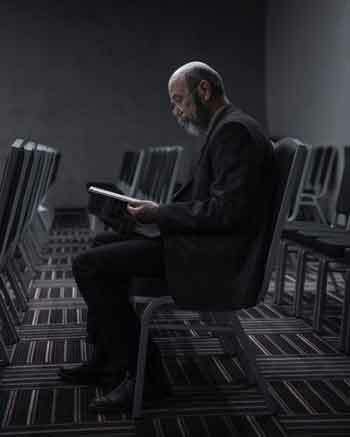 In the video, the tilt of the chair is not significant. I want a back support that provides enough support to keep my posture aligned. You will notice that I am a small person, so a slim roll works well for me. You might need something larger or maybe smaller. If the back of the chair goes way far back, then you might need a larger roll. It is important that the support feels right for your spine and puts you into a comfortable alignment. Once you have elevated the back of the chair and installed a lumbar support, you might need a third modification. If it is a chair that you use for activities that require you to elevate your arms, such as knitting or reading, then you need to make changes to keep your shoulders in a comfortable and pain-free zone. I recommend you place pillows on your lap to support the weight of your arms. Put these three modifications together and you now have a chair that keeps your shoulders happy and helps you avoid rounded shoulders. ﻿ Many of my clients regularly do physical activities that often put them in a forward posture and cause rounded shoulders. Let’s identify some of these activities. For each activity, I will recommend several strategies and exercises to prevent you from developing rounded shoulders. Gardening often takes us into a forward posture. Over time, these repeated movements can cause rounded shoulders. Make sure that you do strengthening exercises for your back, the muscles between your shoulder blades, and the long muscles of your spine to allow you to garden with better alignment. In addition to exercises, you should always be mindful of your posture when gardening. For example, gardeners have to weed the garden, lift heavy objects, mow the lawn, shovel dirt, and rake leaves. These activities are strenuous and can cause you to go into flexion. Below you will find links to blog posts that show you how to perform each of these garden tasks and avoid rounded shoulders. I have clients who love to swim. Unfortunately, many limit their swimming activity to the forward or front crawl, a movement that puts you in a forward posture. I recommend that my clients include movements that counteract the front crawl. 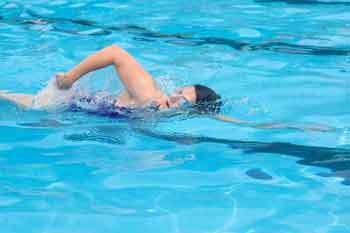 For example, the back crawl is an effective way to counterbalance the front crawl. Many exercise and yoga classes are taught with many of the movements in a forward position. However, that movement pattern brings us into a forward rounded shoulder posture. Many instructors do not like to put you on the ground and have you do back strengthening such as the Prone/Floor M exercises or lifts because it is much easier to run a class with all movements in a forward posture. If you tend to do a cardiovascular exercise or yoga class two or three times a week, think about what you are doing in so far as your shoulders and posture. Do you need to counterbalance these movements? Instead of attending your class three times a week, reduce your attendance to two times per week and commit the free day to a workout dedicated working your back. Spend time opening your chest and stretch the muscles that tend to get short and tight, and strengthen the muscles that tend to get long and weak. We cover several of these exercises in the next section. My book, Exercise for Better Bones, has a whole section dedicated to posture building. Here are four exercises to fix rounded shoulders. The first two are stretching exercises and the remaining two are strengthening exercises for rounded shoulders. They are designed so that you can easily do them at home or the gym. Earlier I mentioned that you should dedicate at least one workout per week to strengthening. These exercises would fit into that session. I encourage you to do rounded shoulder exercises that both strengthen long and weak muscles and loosen muscles that are short and tight. This is one of a number of chest stretches for rounded shoulders found in Exercise for Better Bones. Another great stretching exercise for rounded shoulders is the Arm Reach. It increases the flexibility of the muscles that put you in a forward head posture. Reach your arm behind you. All the while keep your spine straight. You can either reach with one arm, or you can reach with both arms simultaneously. Again, use the support that you need under your head. Some people like to do it as this overhead reach, whatever feels best for you. Anything that starts to open your body up is a great way to start increasing the mobility through your mid-back and help you to regain some of the lost range. 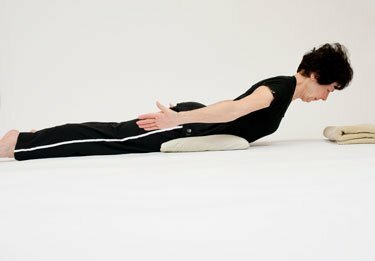 The Prone Exercise in M Position (also known as the Floor M) is a great postural strengthening exercise for rounded shoulders. It targets the neck extensors, spinal extensors, back, shoulders, and spine. The following are the instructions for Prone Exercise in M Position. Your arms are going to be down by your side, and your focus is going to be on lifting your torso with your head in alignment with your body the whole time, off the floor. You’re head is always staying in a neutral position. You do not want to be in a position where you are standing (after the giant flips you) and you are looking up to the ceiling or looking down. That is not a “neutral position” for your head. If you do not find the floor version of this exercise for rounded shoulders challenging, you can find progressively more difficult exercises in this prone exercise post. I prescribe exercise for my clients that improve their forward head posture and rounded shoulders. In the video, I demonstrate the Reverse Fly Exercise. It is very important that you maintain good alignment while performing this exercise and not move your head into a forward position. You will notice that I put my back to the wall and maintain contact with the wall throughout the demonstration. I place the back of my head against the wall. I am able to maintain good posture because I keep my head against the wall as I complete the Reverse Fly Exercise movement. You might consider putting a thin piece of foam behind your head and holding it against the wall during the Reverse Fly Exercise. Stand with your buttocks, upper back and the back of your head against the wall. Keep your chin tucked in and eyes facing forward. Your feet should be four to six inches from the wall, your knees slightly bent. 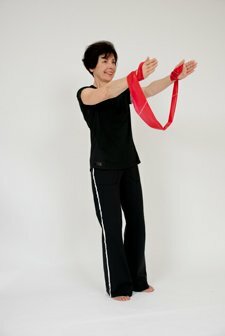 Hold the Theraband allowing roughly 12 to 18 inches of band between hands. Inhale as you raise your arms to shoulder height with your thumbs pointing to the ceiling. Return in a controlled manner to starting position and repeat until set is completed. To ease into this exercise, you can bring one arm back at a time. You should have no more than a hand size space in the small of your back throughout this exercise. Adjust the length of the band between your hands to get the resistance you need. If your head does not rest easily against the wall hold a rolled face cloth between your head and the wall. 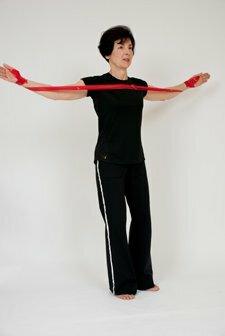 How Long Does it Take to Fix Rounded Shoulders? A number of variables determine how long it takes to fix your rounded shoulders. Have you had rounded shoulders for a long period of time? The longer the time, the more likely it will be an extended period of time undoing what habits you have built up and the status of your muscles. Your commitment to fixing your rounded shoulders. Remember, posture is an active process — meaning you need to be actively aware of you posture all day long and engaging your postural muscles. Access to a skilled health professional. You can speed up the process of fixing your rounded shoulders by working with a skilled health professional such as a Physical Therapist. They can help you make steady progress. I am often asked how to correct rounded shoulders with a brace. While I encourage my clients to fix their rounded shoulder with a combination of changing bad habits and exercises for rounded shoulders, there are times when a rounded shoulders brace can be a temporary way to address the problem. It is not a long term fix (good posture is). Here are two rounded shoulders braces to consider. I encourage you to think about the stationary things that you do (such as sitting) over an extended period of time and try to make modifications that improve your posture and avoid rounded shoulders. Are you repeatedly doing movements that cause you to round your shoulders? How can you counteract those movements through good alignment and exercise? Follow these guidelines and you will soon fix your rounded shoulders. I appreciate the positive comment. Thank you for taking the time to provide a kind word. Keep well. This is really excellent, helpful information! Thank you so much for posting. I can’t tell you how many times I hear people tell someone to “stand up straight”, but there are never any specific steps given. Hi Suzanne, You are very welcome. Posture is one of my pet peeves. Glad you find the information helpful. Thank you for taking the time to let me know.